Sybille von Schoenebeck was born on 16 March 1911 in Berlin (Charlottenburg). Her father, Maximilian von Schoenebeck, belonged to the south German anti-Prussian aristocracy, and her mother, Elisabeth Bernhardt, to a rich partly Jewish family from Hamburg. Her early childhood was spent in Berlin, at her father’s ex family in law – he had had a first marriage and was a widower – in a luxurious Jewish household in Voss Strasse. In 1915, her parents settled in Feldkirch, a tiny village in the Black Forest, near the French boarder, in a Schloss bought in 1910 as a place in the country where to house “Herr Baron”’s gothic collection. Her mother, a notorious bolter, was very often absent. Far from resenting it, Sybille from very early on was always on the side of the lovers. After her parents’ divorce in 1921, Sybille lived alone in the Schloss with her father and a housemaid in real poverty, her mother having generously given the Schloss to her husband but no money. 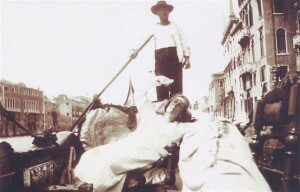 In 1926, after her father’s death, Sybille joined her mother in Italy. With the rise of fascism there, they soon left and moved to France on the Mediterranean coast. She spent the next decade shuttling between France and England, where it was intended she obtained an education, although she appears not to have ever attended school. 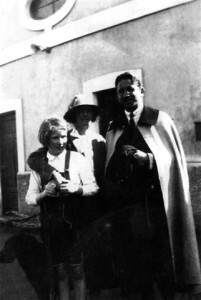 In Sanary where her mother finally settled with her young Italian husband, she met the Huxleys, Aldous and his wife Maria. At first Sybille was only a silent awe-struck adolescent sitting at the end of the table, but gradually, as she was forced to take care of her mother’s morphine addiction, they took her under their wing. Her friendship with the Huxleys changed the course of her life. Her mother, unmaternal as she was, had opened her mind to literature and politics – she was strongly anti-war -, but in Aldous Huxley Sybille found the mentor who would influence her morally and intellectually all her life. His encouragements also confirmed her very early vocation: to be a writer. In Sanary, she became part of the colony of artists and writers who had fled Nazi Germany and joined Thomas Mann and his family on the Côte d’Azur. She befriended his children, Klaus and Erica Mann. An article she wrote for Die Sammlung, an anti-Nazi magazine founded by Klaus Mann, attracted attention in Germany and led to her remaining German investments to be confiscated. Her passport, about to expire, also put her at risk. In 1935, to obtain an English passport, she was married in London – a brief marriage of convenience – and became Sybille Bedford. Multilingual since her childhood in a very cosmopolitan milieu, she had rejected German and at one point hesitated between French and English. She finally chose the English language as the best suited to her voice as a writer: concise, fluid, malleable. In 1940 she left France for the United States of America, via Italy and Spain, and lived in exile, first in California, then in New York. She returned to Europe after the war and settled in Rome in an eccentric flat on the roof of a building, in the Piazza di Spania. In 1953 her first book was published, A Visit to Don Otavio (original title: The Sudden View), an account both serious and hilarious of the year she spent travelling in Mexico in 1946. At last, she was a writer. Her passion for the law was born when, as a young adolescent in London, instead of going to the cinema or theatre matinees, she started to spend time in the law courts in the Strand and was immediately captivated. Her first law book The best we can do in 1958, is an account of Dr John Bodkin Adams’ trial, followed by The Faces of Justice (1960), a “not quite straight-faced” reporting of legal practice in the law courts of England, France, Germany, Austria and Switzerland. She was commissioned by newspapers and magazines to cover several great trials, the Lady Chatterley prosecution, Jack Ruby’s trial for the murder of Lee Oswald. Her account of the trial of Auschwitz officials in 1964 is one of her strongest and most profound essays. Between two other semi-autobiographical novels, A Favourite of the gods (1963) and A Compass Error (1968), she spent six years of her life — “a labour of love”, as she called it herself – researching the biography of Aldous Huxley, at his widow’s suggestion. This monumental work, published in 1973-74 was unanimously praised by the critics and hailed by Stephen Spender as “one of the masterpieces of biography”. Jigsaw published in 1989 and short-listed for the Booker Prize, is the only novel she wrote in London, where she finally settled in 1979 when her fragile eyes couldn’t bear the Mediterranean sun any more. A very active member and a vice president of PEN, Fellow of the Royal Society of Literature since 1964, she was awarded the O.B.E. in 1981. In 1994, she was elected Companion of Literature, a position held by only ten British writers at a time. Sybille Bedford was also a lifelong connoisseur of food and wine, and wrote many articles about food, wine and travel. Some of them are gathered in As it was: Pleasures, Landscapes, and Justice, published in 1990. She contributed to The Good Cook, a Time-Life encyclopaedia, edited by Richard Olney, and was in charge of the guide to the wines of the world, that forms part of it. Her last book, Quicksands, a memoir, published in 2005, one year before her death was her first openly autobiographical book. All her novels are inspired by her own memories or her family past, but in them she constantly played hide and seek with her readers. She had originally given a subtitle to Quicksands: Perspectives of an Outsider. After her unusual upbringing, her bohemian childhood and youth, Sybille Bedford always remained in search of roots. If France and Italy were “les patries de son coeur” and her language English, she felt deeply European. She considered herself a survivor of the tragic century she had lived through, often meditating on how chance or a chain of circumstances decide the fate of an individual. But her appetite for life and for the sensual pleasures of life never left her. As she used to say, she would have written more, had she loved less. She had a rich emotional life and a great talent for friendship. In her later years Sybille Bedford retained a boundless curiosity for the world, a deep compassion for mankind, a mind wide open to the wonders of life. She was not only a writer with a gift of acute observation and a wonderful dry wit, but a true artist, who brought the same integrity and high principles into her art as into her life. “What is the best reason you have ever given yourself for writing at all?